Nearly all Shopify stores that aren’t making any sales or enough sales show poor choices in page metadata. We’ll show you how to fix your Shopify SEO metadata descriptions, so you do better in search engines, and get more store sales. We see stores with ingredients for an excellent customer experience – plenty of products, decent product descriptions, an about us page and correct image alt text … And still, after several months they have few or no sales because of poor page metadata. So what’s page metadata and how does it help get sales? It’s the title and description of a web page that’s encoded into the page but not displayed on the screen. In fact, to the visitors to your Shopify store, it’s actually invisible data and HTML code. If it’s invisible, why is it so important? Well, because who sees it and pays attention are the search engines, such as Google. Page metadata provides vital information to search engines about the content and purpose of your store. Visibly, page metadata is what’s shown when someone searches a term in Google, and your page turns up in the results. If you want to know which pages to prioritize, we’ll tell you in the FAQs below. 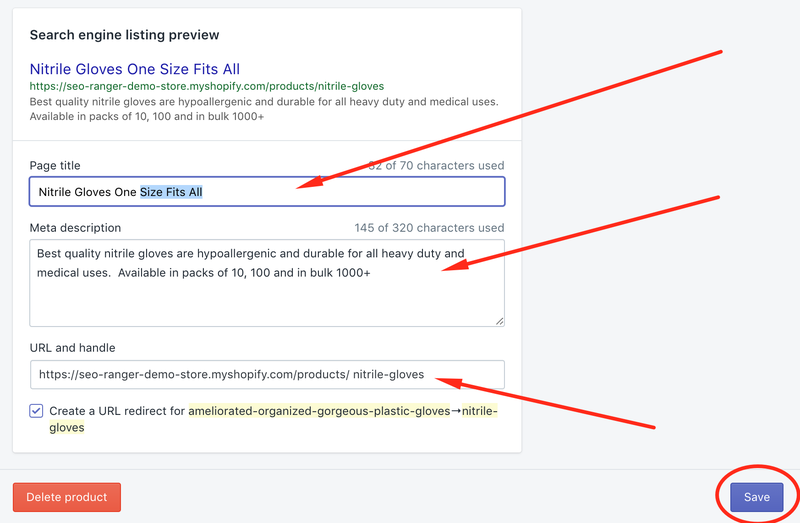 Let’s look at the three essential elements of Shopify page metadata, ‘title,’ ‘metadata description’ and ‘URL and handle’ and show you how they appear in search engines. Your Shopify Page Title is the single most important element on the page, it will appear in google like this above, and it’s the main thing people searching will see and absorb. The Page Title is telling the search engines what the whole page is about and which of the keywords to focus on. Your store has a different title for every object (products, pages, posts, collections). You should make your store titles 70 characters or less including spaces. Descriptions are shown right below the Title and the page URL, like this example above. It provides more information than the title about what’s on your page and helps people decide whether to choose the page to answer their search query. In other words, the better your description, the more likely people will click through to your page. Each description for every object (products, pages, posts, collections) on your store should be unique. We’ll show you exactly how to make changes to your store’s page meta descriptions below. If you need help with what to write into your descriptions, you can find our guide here. Shopify automatically designates a default handle based on the title you’ve used. The handle also determines the URL of the object. So, a page with the handle “our-story” would have the URL “http://yourdomain.com/pages/our-story.” If you modify the title of an object, Shopify does not automatically update the handle. And, if you’ve duplicated pages to save time, you’ll know this can get pretty messed up, and you’ll want to update your URL and Handle. We show you exactly how step-by-step below, but if you have questions you can contact us here. 2. Choose the product from your list you’ll change by clicking on one product title. The process is the same to edit your Shopify Page Metadata for Product Collections. Just start by choosing Products from your menu on the left, then click Collections. 4. Several boxes will appear, update the text in the boxes – Page title, Meta description, and URL and Handle to what you like. If you change the URL and Handle, make sure the “Create a URL redirect for…” is ticked. 3. Choose the one from your list you’ll change by clicking on the one you want. Do I really need to write a description for every page? Ideally yes. If you are overwhelmed, start with the most important pages first which are your homepage, collections, and product pages. If you have hundreds of product pages, first focus on doing the best job for products already getting traffic. We show you what to write for your homepage and product pages here. What if I leave my title blank? Your theme will use your shop name followed by the title of the content or; will use the title of the content followed by your shop name. What if I leave my description blank? Your description will be auto-generated from the page. Auto-generated sounds like less work, but to get better click-through rates, you’ll want to edit them. Where the description doesn’t look good or you have keywords you want to be targeted leaving the description blank is a bad idea. I made some edits but I can’t see my changes when I visit Google? You will need to wait a couple of weeks for your edits to show up in search engine results. It may take a few weeks for search engines to crawl and re-index your content. How can I edit my page metadata for collections? It’s the same as editing the page metadata for products. Just start by choosing Products from your menu on the left, then click Collections. I’m still confused on what to write and need help? If you are stuck on what to write, just check out our guide here. And if you still need help or have questions, we’re a friendly dedicated support team, and you can contact us here.